For the 1992 film of the same name, see Bram Stoker's Dracula. "Bistritz, Hungary May 1897": natives in Transylvania seem afraid when they learn solicitor Jonathan Harker is going to Castle Dracula. Jonathan finds the Count abrupt and impatient to get things done. Dracula reacts very strongly to a photograph of Harker's fiancée Mina and her best friend Lucy. After preventing his brides from devouring Harker, he forces the young solicitor to write a letter saying that he will be staying in Transylvania for a month. Harker climbs down the castle wall and finds Dracula's coffin, but is attacked and knocked out by one of Dracula's gypsy servants before he can stake Dracula. They later throw him in the lower levels of the crypt, where the brides attack him again. The Demeter runs aground carrying only Dracula and the dead captain lashed to the wheel. Soon after, Lucy begins to fall ill. Her fiancé, Arthur Holmwood, is perplexed and calls in Dr. Van Helsing. The doctor begins to recognize what might be happening, especially after Lucy walks out of her home at Hillingham and is found, drained of blood, under a tree the next morning. Dracula has flashbacks of his wife - of whom Lucy is the spitting image - on her deathbed centuries earlier. Lucy's mother is in the room with Mina when Dracula comes calling the last time, a wolf shattering the window. Lucy soon rises from the dead, and comes to the window of Arthur's home, begging to be let in. Arthur does so, delighted and amazed that she's alive, unaware that she is now a vampire under Dracula's control. This very nearly gets him bitten, but Van Helsing interrupts with a cross causing her to flee. They go to Lucy's grave and drive a wooden stake into her heart. When Dracula comes to the tomb later and beckons to her, he goes berserk upon finding that she's truly dead. Mina tells Van Helsing about the news story about the Demeter and the boxes of earth, and about Jonathan going to meet Dracula to sell him a house. From these clues, Van Helsing and Holmwood go about finding all but one of Dracula's "boxes of earth" (containing his native soil, in which a vampire must rest). But back at the hotel, the vampire hunters discover Dracula is there seeking revenge. He has bitten Mina, and before their eyes forces her to drink blood from a self-inflicted gash in his chest. All that they love, all that is theirs, he will take, he says. The tracking of Dracula back to his home commences with Van Helsing hypnotizing Mina. Via the bond of blood, she sees through Dracula's eyes and discovers where he is headed. At the castle, Van Helsing and Holmwood find and stake the brides. Jonathan, now a rabid and bloodthirsty vampire, attacks Arthur and Van Helsing, but in the struggle is knocked by Arthur into a pit of spikes. The final confrontation with Dracula takes place in what looks like a grand ballroom. The crosses wielded by the two men are something Dracula doesn't seem to want to look upon. Dracula gets the better of them, ridding them of their crosses. Van Helsing pulls down the window curtains and sunlight pours in. Dracula is weakened, finally going dormant long enough for Van Helsing to pierce his heart with a long spear. They leave him there. Before the portrait of a living warrior Dracula, with Lucy's lookalike in the background, a text scrolls across the screen, about a warlord who lived in the area of Hungary known as Transylvania, and how it was said he had found a way to conquer death—a legend no one has ever disproven. The lord's name is DRACULA. The initial broadcast in October 1973 was pre-empted for an address by Richard Nixon on the resignation of Spiro Agnew. Instead it was broadcast in February 1974. According to the featurette on the DVD, Jack Palance had been offered the role of Dracula several more times after his first performance, but he turned them all down. Dan Curtis decided to film Bram Stoker's Dracula in two locations: Yugoslavia, where there were old castles and quiet land, and England, where the remainder of the story is set. The original title was Bram Stoker's Dracula. The film was also released under that title on VHS and Laserdisc. Francis Ford Coppola and Columbia Pictures purchased the rights to that title in the early 1990s. Coppola wanted to make it clear that his Dracula movie was unlike any other Dracula movie before it. Coppola's film also takes inspiration from the two key elements in Curtis's film that separated it from other adaptations: making the Dracula character and the historical Dracula, Vlad the Impaler, one and the same person, even though Bram Stoker was unaware of the latter when he conceived of his novel; and a reincarnation romance with Dracula's dead wife. 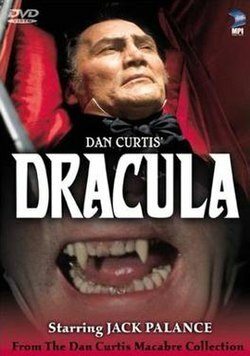 Nearly all home video releases of Curtis's film have since been released under the title Dan Curtis' Dracula or simply Dracula. The Marvel Comics series The Tomb of Dracula features a Dracula whose appearance was based on Jack Palance. Palance had at that point yet to play Dracula and Tomb of Dracula artists Gene Colan got the idea from Palance's performance in Dan Curtis' The Strange Case of Dr. Jekyll and Mr. Hyde in which he appeared in 1968. ^ Joshi, S.T. (2011). Encyclopedia of the Vampire: The Living Dead in Myth, Legend, and Popular Culture. ABC-CLIO. p. 61. ISBN 9780313378331. ^ a b Scivally, Bruce (2015). Dracula FAQ: All That's Left to Know About the Count from Transylvania. Backbeat books. ISBN 978-1617136009. ^ Smith, Gary A. (2017). Vampire Films of the 1970s: Dracula to Blacula and Every Fang Between. McFarland & Company. p. 181. ISBN 9780786497799. ^ Marx, Andy (26 January 1992). "A look inside Hollywood and the movies. : QUICK BITES : Bet You Thought Bela Lugosi's Neck Biter Was True to Bram Stoker". The Los Angeles Times. Retrieved 22 November 2010. ^ Silver, Alain; Ursini, James (2011). The Vampire Film. Hal Leonard. p. 155. ISBN 978-0879103958. ^ Field, Tom (2005). Secrets in the Shadows: The Art & Life of Gene Colan. TwoMorrows Publishing. p. 99. ISBN 9781893905450.